bexley, bromley, greenwich and lewisham. 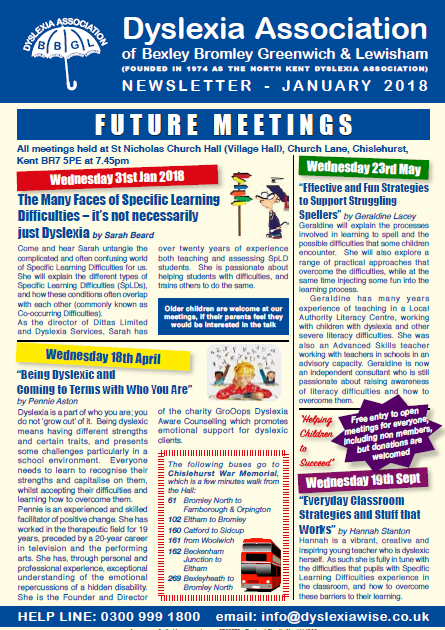 Dyslexia is now more widely recognised as a special need, thanks to the work and support by the Dyslexia Association of Bexley, Bromley, Greenwich and Lewisham. Membership is available. For dates, please visit our website. This line will be manned on Monday, Tuesday, Thursday and Friday from 12 - 3pm. Please visit the website for the latest version of the DABBGL newsletter and upcoming events. Open Meetings – free entry to everyone, including non-members but donations welcomed.Separate Adult Group meetings. A dyslexia screening service for children and adults. Training for employers, schools, parents etc. DABBGL held a presentation evening with Brian Lamb on the upcoming changes to the SEN law. It was a very informative evening and although it is aimed at Dyslexia, it includes information for all special/additional needs. Please see below and note that is a power point presentation.